Most of us have heard that the Galaxy S4 is due right at the end if the month, with the date of Tuesday April 30 being the most talked about launch date. However, you may not have to wait that long if the AT&T site is anything to go by. 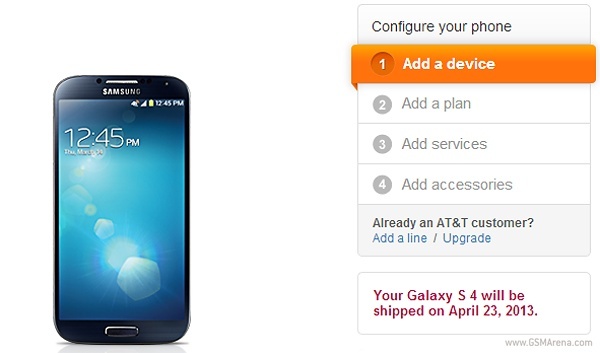 On Tuesday April 30, 14 US retailers will be selling the much-anticipated Smartphone, but on the pre-order page of carrier AT&T, you can clearly see that they have revised their shipping date, stating that the Galaxy S4 will be shipped by them on April 23. Are you going to be getting your hands on the Samsung Galaxy S4.